Join us for soup supper at 6:15 pm. Pastor's Message - SPRING HAS ARRIVED! LENT SERIES – LET MY PEOPLE GO! Our Midweek and Holy week series this year is put together by Dr. Reed Lessing and is based on the book of Exodus. 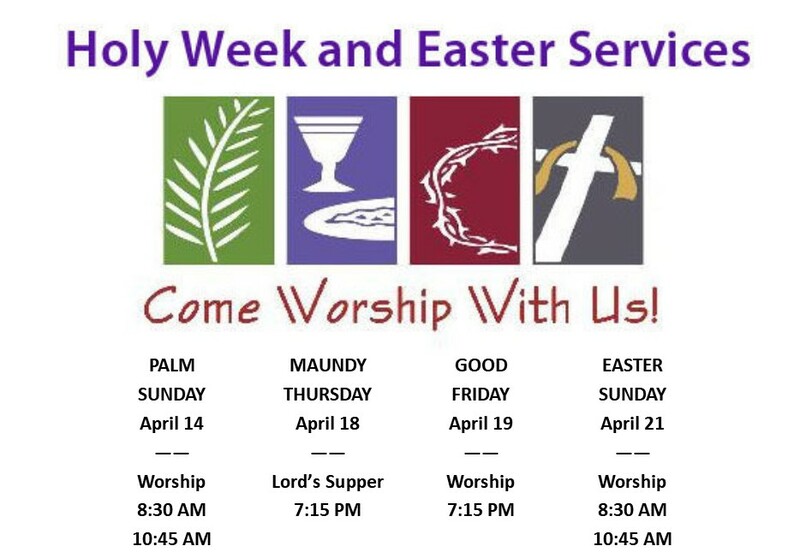 Here is the schedule for the entire season including the Sunday’s in Lent which are not part of the series. Soup suppers start at 6:15 and Lent services will be at 7:15 on Wednesdays. If you have not picked up a Lenten Devotional book they will be available again this Sunday. As a reminder, there will not be an Easter vigil this year due to the lack of interest last year and people indicating they would rather not have it. The next LWML events that are coming up are a Zone Rally on Saturday, May 4th at St. Philip’s Lutheran Church on Upton Ave. The speaker is Dr. Farrukh Khan, who will speak about sharing the Gospel with Muslims in our community. There is also a district servant event to be held in the Columbus area on May 18th, from 9:30 – 3:00 pm. (Continental breakfast and lunch will be provided.) After a Bible study, several types of projects will be done at St. John’s in Dublin, OH. (Needles and thread not required!) While it seems like a long drive to do a few hours of service, you will have the opportunity for fellowship with wonderful women from around the state, and with those riding together in the car! I’d like to take several women with me. Let me know if you’d like to come. Copies of the latest Lutheran Woman’s Quarterly are available in the narthex. The magazine features 18 young women who are making a difference in the LWML. There is also an article about Y4LIFE, which is a ministry of young people who are mentoring their peers when facing unplanned pregnancies. This is one of the projects that is supported by our mites. Psalm 19:14 “Let the words of my mouth, and the meditation of my heart, be acceptable in thy sight, O Lord, my strength, and my redeemer “. Remember to give to missions and Time to renovate as well as your weekly offering. Also, remember the men and their wives of Laborers for Christ who helped build the new Sanctuary and did other remodeling in 2001 and 2002. When you can, give money for Laborers for Christ to help Missouri Synod Lutheran Churches build and update their buildings. Also, please remember to give to Good Shepherd of the Deaf. Saturday, Apr. 20th, 8-9:30 am - Our Men’s Group will meet again the third Saturday of the month at 8:00 a.m. for donuts and coffee and short study. This will be followed by an hour of working on maintenance of the church.